Subwoofers boom the thunder, the rumbles, the explosions and the guttural lows that bring music and DVDs to life. Reproducing low frequencies from 20-100 Hz, subwoofers let other speakers be diminutive and unassuming. In other words, your other speakers’ cabinetry doesn’t have to be as large because they’re not being asked to produce the really low bass waves. Subwoofers come in a variety of designs. All of them can work fine if they’re well designed and well made (with the exception of passive subs which we’ll get to in a moment). It lets you adjust the loudness of the sub so that it works seamlessly with the rest of the system. It filters out unwanted frequencies so that it receives just what it’s designed for: low bass. It equalizes its output to compensate for some of the possible loss of bass due to a smaller box. Some subwoofers give you the option to adjust the phase, which means the phase can match your front speakers regardless of their placement. Passive subwoofers, instead of having their own amplifier/pre-amp, borrow power from the receiver to move the woofer. Another shortcoming is all the features you’ll love so much about a power sub are absent except for only one: the filtering of unwanted frequencies. Yet, even this isn’t done with much skill. Sealed Box: A sealed box design is exactly what it sounds like. If well built, it provides a tight, well-defined bass. Ported Box: You have probably noticed that most subwoofer boxes have a hole in them. This hole is referred to as a port. 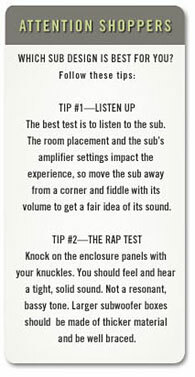 The advantage is that a ported sub can usually produce lower bass tones, per watt input, than a non-ported sub. Isobaric designs do just that. Imagine two woofers mounted at both ends of a tube. Now, place this tube into a box so that all you actually see is one woofer. Because the air pressure in the tube will be half that of the enclosure, this fools the front woofer into thinking it’s in a box twice as big. The end result is half the box size. Unfortunately you also get half the efficiency. One woofer backwards. This design reduces harmonic distortion. The main cause of harmonic distortion in woofers is the difference between the out-stroke and the in-stroke of the woofer. This difference is caused by magnetic anomalies around the voice coil, manufacturing errors and suspensions that are stiffer moving in than out. When you mount one woofer backwards, but wire them up so that they both move in the same direction, the sound from the two woofers reinforce each other (in phase) while the distortions cancel each other out (out of phase). Clever, but the value is less than one might think. Not only are humans insensitive to harmonic distortion in the bass region, harmonic distortion by nature is, you guessed it, harmonious. So not that unpleasant.